What topics would you like The Catholic Spirit to report on in upcoming issues? That’s the question posed to pastors in a recent e-mail. One of the most passionate responses came from Father Eugene Michel, OFM, of Sacred Heart in St. Paul, who requested we do an article examining the impact of U.S. immigration policy on his parishioners, many of whom are undocumented. He invited me to hear his and their stories. The majority of parishioners at Sacred Heart hail from Mexico, followed by El Salvador, Father Eugene said. Others come from Guatemala, Honduras, Costa Rica, Nicaragua, Panama, Colombia, Peru, Chile, Ecuador, Bolivia, Puerto Rico, the Dominican Republic and several non-Hispanic countries. In subsequent issues, we have invited immigrants from Sacred Heart to tell us about the circumstances that brought them to this country and what life is like for them now. 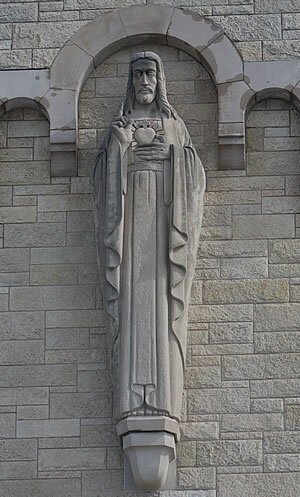 Sacred Heart parish was founded by German immigrants on St. Paul’s east side in 1881. The current church building, known by parishioners as “the beacon on the hill,” overlooks the Mississippi River in St. Paul’s picturesque Dayton’s Bluff neighborhood. As I drove past ornate Queen Anne Victorians, brownstones and brick manors leading to the church, I couldn’t help but notice that the once thriving neighborhood had fallen on hard times. In recent years, Dayton’s Bluff has become home to a growing immigrant community — many of them Latinos who attend Sacred Heart, or Sagrado Corazón in Spanish. Of the 1,000 or so people who show up for Mass on the weekends, about 800 are Latinos, Father Eugene estimated. The priest greeted me last week at his office in the basement of the former Sacred Heart School building. He wore his brown Franciscan habit for the interview because, he stressed, his views on immigration have been shaped by his Franciscan values. Seated at the head of a long table, a framed picture of Our Lady of Guadalupe with a Franciscan cross dangling below it on the wall behind him, Father Eugene told me about his parish and the challenges his parishioners face. Below are excerpts from our conversation. How has ministering to immigrants shaped how you feel about the issue of immigration? Working with immigrants directly is like putting a human face on the issue. The church has said everything that’s supposed to be said about this, that is, in the documents that the bishops put out some years ago. [See Church’s teaching on immigration explained.] All of that was said very well, and it was true and it was good. But it doesn’t have a face on it. The issue of immigration is not a thing; it’s human beings, people. Why is immigration something that Catholics in particular should care about? As Catholics, we take seriously the words that come out of the Scriptures. When Cain is asked by God, “Where is your brother, Abel?” he says, “Well, am I my brother’s keeper?” We’ve got to be our brother’s and sister’s keeper. We don’t have a choice about that if we’re going to call ourselves Christians. Over and over again, the Scriptures say things like God hears the cry of the poor, he is attentive to the poor, he acts kindly toward the poor. And in one of the prayers of the church, . . . it refers to “the poor, to whom Christ has promised a chief place in heaven” — the poor, not just financially, but poor in the broader sense, too, in people caring for them, lacking acceptance and love. So we should be concerned about [immigrants] from that perspective. Have any of your parishioners been deported? If so, how did that affect you? Several. One just recently. They get sent back, and the problem is that deportation often separates the family. Sometimes we try to find some money to help them. I can’t buy tickets back to El Salvador or Mexico very often, but I’ve helped some get their tickets. It’s a sadness [when someone is deported]. It’s overwhelming at times, like how can this be? . . . The human tragedy is so clear. If a mother comes in and she’s crying and she’s got her two little children hanging on her and they’re going to be deported, it’s like they’re torn away, they’re separated. It’s hard to imagine what that would mean for me if I were being torn away and arrested and dropped off at the border. What would you say to people who don’t feel much compassion for the plight of undocumented immigrants because they say they have broken our laws? Now, there’s something wrong about that. Should anybody have to worry like that? We’ve created fear for the immigrant. We’re looking at laws as being more important than people. No one should have to be in the shadows. It’s about human dignity. What changes to our immigration system would you like to see? Our immigration laws need to be changed and made just. One thing I think is very unjust is it takes forever to become a citizen. It’s so long that they can’t survive. And the present system splits up families. Of course, there have to be laws; we can’t just open up the border. People do need to have good reasons for coming here. But, I think there should be an amnesty program like there was back in the ‘80s that would not touch anybody here already. Let’s start from scratch. The Catholic perspective, and the popes have been very clear about this, is that people have a right to seek a better life and to be able to support their families. We, as Catholics, need to welcome [immigrants], wherever they’re coming from, with open arms. 1. People have the right to find opportunities in their homeland. A person has a right not to migrate. Economic, social and political conditions in a person’s homeland should provide an opportunity for a person to work and support his or her family with dignity and safety. Efforts should be made to address global economic inequities through just trade practices, economic development and debt relief. 2. People have the right to migrate to support themselves and their families. When people are unable to find work and support their families, they have a right to migrate to other countries and work. The right to emigrate applies when there are just reasons for it. Today, global poverty is rampant and political unrest has resulted in wars and persecution. Consequently, migrants who are forced to leave their homelands to survive and support their families must be given special consideration. The church recognizes the right of sovereign nations to protect and control their borders. However, it is not an absolute right. Nations also have an obligation to the universal common good, and thus should seek to accommodate migration to the greatest extent possible. According to Catholic social teaching, powerful economic nations, such as the United States, have a higher obligation to serve the universal common good. People who flee their homelands because they fear persecution should be afforded safe haven and protection in another country. The United States should employ a refugee and asylum system that protects asylum seekers and refugees, and offers them a haven from persecution. 5. The human rights and dignity of undocumented immigrants should be respected. For more information about immigration from a Catholic perspective, including a June 2010 statement by Minnesota’s bishops calling for comprehensive immigration reform, go to http://www.mncc.org/issues/immigration-sunday .